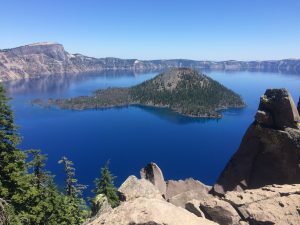 The most famous natural wonder of Oregon is probably Crater Lake. 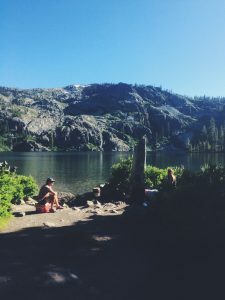 The PCT passes right by, so naturally hikers take a day off and hike the rim trail around the lake. 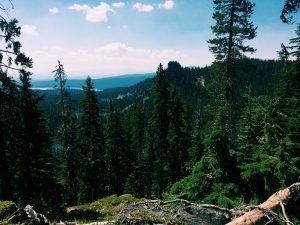 I was able to sneak in the national park without paying by taking a sketchy side trail that dumped me out at the village part of crater lake. It was at this village that I met a new group of hiker I would end up being with until the present moment. The group Consists of Peanut, a female lawyer in her thirties. 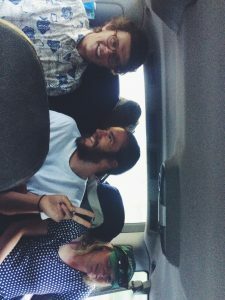 Lt. Dan, a 24 year old from Israel that has been traveling the world for well over a year now. Fluffy, a theology/philosophy major in his thirties and Joe Dirt, a recent college grad from california. 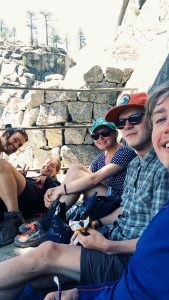 It was with this group that I rode the bus from the village to the rim of crater lake. From there we ventured to a beautiful lodge right on the lake edge and enjoyed a fancy breakfast with a breathtaking view. The meal was so good it made the idea of hiking unappealing so we rested on the porch watching the boat in the lake and the tourists running around taking pictures. Slightly after noon we headed out and hiked the rim trail. The clarity of the water below and rich blue tones of the lake were breathtaking. 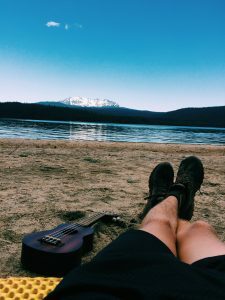 I found a shady spot on the edge and played the three songs I now know on my ukulele. 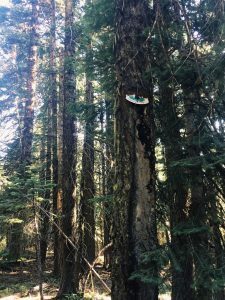 I eventually took a side trail back down to the pct and resumed my hike. After my nature high from time spent by the lake, the trail was less appealing for a day or two. That wore off though and eventually life on the trail continued. With my new group I hiked to shelter cove, a small rv resort where our close family friend Jim Plant picked me up. He took me back to his house to take a few days off trail to rest. We went to the movies twice and after a hours of netflix I feel like I’m caught back up with all the films i’ve missed. After two days he dropped me back off at the trail and I pushed on with hopes of catching back up with my new group in the town of Bend. Before leaving Ashland, my mom gave me money to get a massage. On the way to get it, I saw a music store and decided to stop in. While in the store I fell in love with ukulele. After a call with my mom it was decided and I spent the massage money on the instrument. So there is now music on the trail! I loved my time in town but no matter how nice Ashland was, I was happy to start this new stage of my journey in an all new state . 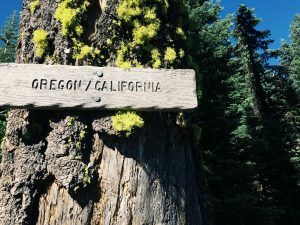 Oregon is famous on the PCT for its beautiful forests and flat trail. In fact the trail is so flat that there is a challenge where you backpack across the whole state in two weeks. 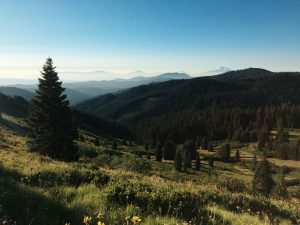 Even though I didn’t want to rush through Oregon, I was stills able to do close to 30 every day without killing myself. Additionally every few miles is a beautiful lake so I have been able to stay pretty clean. Before I left, I heard rumors of the mosquitos that plagued the trail in this section. I didn’t take heed of these warnings and left without bug spray. For this I paid the price. Only a day after getting back on trail had over 50 bites all over my body. Even while walking I would be getting bitten by multiple bugs at a time. This was extremely frustrating but on a positive note it made taking breaks hard to do so I pushed farther, inevitably doing more miles per day. The bugs aside, the shady forrests and plentiful lakes and rivers have made for amazing hiking. Every day is a new adventure in this new state and I love it. After nearly three months of walking, on the 16th of july I crossed the border into the second state of my journey. Oregon! Oregon has been a short term goal of mine for a long time. The scenery and trail hasn’t changed much but just the knowledge that the biggest part is behind me is incredible. The final stretch in california was a time of reflection for me. I have gone through so many different climates, met so many people, had good days and had bad ones all in this state. It is beautiful and diverse. Most importantly, it has given me countless memories I will cherish for a lifetime. Just to put a cherry on top of the sunday, less than a mile before the border was some trail magic. 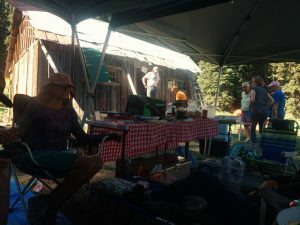 A group of people were remodeling an old cabin and decided to help hikers as well. So for my last afternoon in this state I sat and drank sodas and ate hotdogs with my fellow hikers. Once in oregon I only had 17 mile to my first town, Ashland. Luckily my Aunt Sarah used to live her. So out of her kindness, she called around to old friends and was able to find me a place to stay. I was also treated to the best breakfast I have every had at a restaurant called Morning Glory. All in all the start of the state has been great and I only expect it to get better. We didn’t get out of Shasta until after lunch and had 4,000 foot climb in the hottest part of the day. The direct sunlight and steep rocky trail were brutal. Even though we left late in the day we still tried to get in as many miles as possible. This ment pushing hard all day. Around 9pm we arrived at camp exhausted physically and mentally. We had only gone 22 miles that day and had to stay on a 25 mile per day pace in order to make it to the next town without running out of food. We were already behind. The next day my goal was 30 miles to make up for the difference. Once again temperatures reached in the high 90s and I found myself constantly laying down to sleep. Even with the exhaustion I pressed on all day. By the time I arrived at camp I had done 27 miles but felt like I had done 50. I had pushed all day and not reached my goal. Mentally I was completely drained. I found a campsite and collapsed into my tent, falling asleep almost instantly. The next morning I felt a little better but my body didn’t want to move. Even so, I still had miles to make so i packed up and trudged forward. My pace massively slowed down compared to the days before. Surprisingly, a slower place seemed helped me stay positive and take few breaks. By the end of the day I had done 33 miles. More miles than each of the past two days and I felt good the whole time. So I have decided to change my pace. Going slower helps me go father. I guess is the story of the tortoise and the hare. My goal now is the go slower, and go longer. We will see how this works in the upcoming weeks. I few miles away from I5, where I could hitch to the town of Shasta, I saw a cooler and of course opened it up hoping for trail magic. I was not disappointed and had a cold coconut water on this hot July day. Additionally, in the cooler was the number of a trail angel named Kellyfish. When I got to the road I called her and she said the guy I was hiking with and I could stay in her back yard. When we arrived we learned that she lived in a very cool “tiny house”. This movement is growing in popularity but I had never seen one in person. 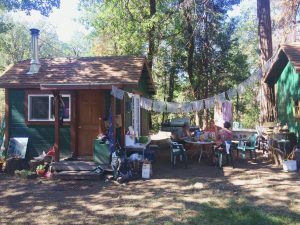 In her 10×10 house there was only a small bed, desk, and small wood burning stove. The kitchen was outdoors, as well as the restroom. We instantly hit it off with Kellyfish and decided to take a zero day there. On most zero days you pretty much just sleep but on this particular one, we decided to go the complete opposite direction and work. It was all hands on deck. Princess, the guy i’m hiking with, fixed her sink. Five, another hiker in on the effort, cleaned and straightened, and I painted her trailer. At the end of the day Kellyfish was so grateful that she took us to swim in her favorite alpine lake. The rest of the afternoon was spent in relaxation, accompanied by a feeling of accomplishment. After having been mostly taking for the past few months giving back felt good. 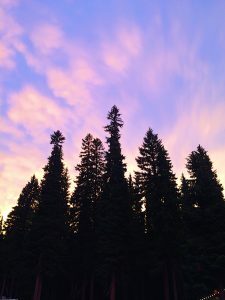 As I continued my trek through Lassen National Forest, my daily mileage grew and grew, eventually beating the mileage I was doing in the desert. I went from low twenties to mid thirties and started making real progress. Even though the recent days have been long, they have managed to stay eventful. 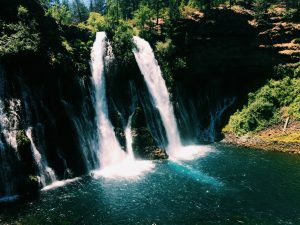 Firstly, A few days past Drakesbad Guest ranch we reached Burney Falls. This is a huge, 128 foot waterfall that throws water off its cliff edge into the crystal clear pool of below. Because of its beauty and power, it’s reputation has grown and I was amazed to see so many people. I’m sure being a few days before the 4th of July didn’t help either. We only stopped at the falls for a few minutes and were soon back on the trail. 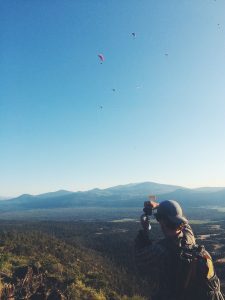 The holiday weekend seemed to have brought out quite a few people and the next evening we watched from a short distance as almost thirty paragliders jumped from a cliff and sailed into the sky. They flew around each other for hours and gave us a show while we walked. Another cool thing about this past section has been the wildlife. The deer have been plentiful and surprisingly bold. 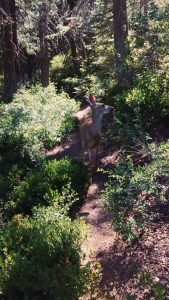 As I walked down the trail one walked toward me. Eventually standing not more than three feet away. 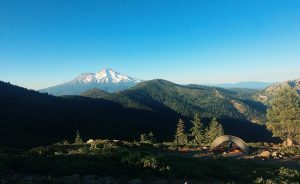 That night, my buddy awoke to one standing over him while he cowboy camped. In addition to the deer are the bears. 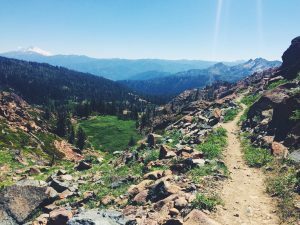 Lassen is known for their bears and some hikers saw four within a single hour. I was only able to see one during my hike through this section, but that was enough for me. The most exciting thing about it all, is the fact that I am less than 200 miles from the oregon border. 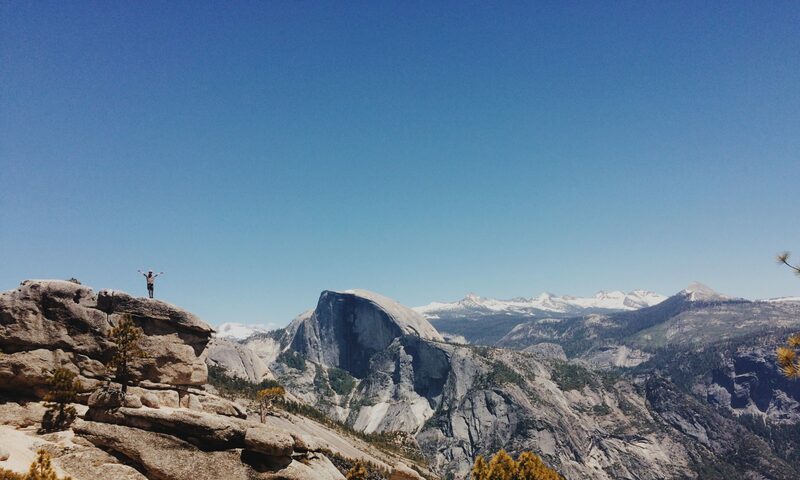 Within a week of hiking I will be saying goodbye to Cali (for now). Although the trail possesses immense amounts of natural beauty, it is the people the make the experience as special as it is. With that said, I feel I have neglected this part of my experience in my blog. To fix this, I will introduce you to the people that I have shared the past few months with. From mile 263-788 I backpacked with a guy named Harry. Harry is a 19 year old from Houston Texas. As it just so happens, he will be starting Trinity university in San Antonio this year. Harry runs cross country and ran for a D1 school but didn’t like the grind so he decided to go to trinity. His cross country skills show in his hiking and I had to work hard to keep up with him. The only thing better than his hiking pace are the constant and terrible puns. Sadly, he had to get off trail to train for his upcoming season so in Bishop, we split ways. Prince is a 20 year old from Denmark. 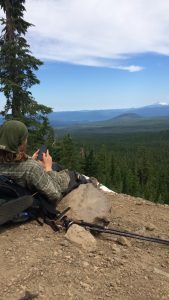 Having never backpacked a day in his life, he decided to do the pct and has been on trail ever since. Additionally, he wins the award for carrying the most candy of anyone on the entire trail. Because of this and his generous spirit, he is a easy person to like and quickly makes friends wherever he goes. 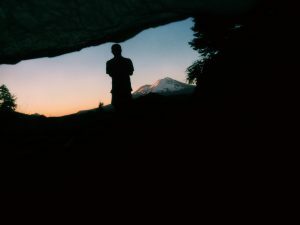 I started backpacking with Price at mile 702 and split up with him less then a week ago. Hummingbird just celebrated her 21 birthday on trail. She is a graduate student at University of Rochester and is studying molecular genetics. 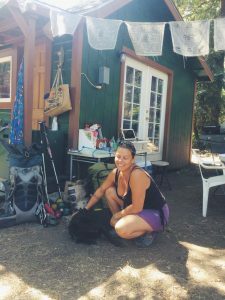 Despite meeting much criticism for the idea of attempting the trail, she went anyways which is just one testimony to her drive as an individual. I don’t know if I’ve ever met a more driven person. Even though her hiking pace is slower than mine, she is over 80 miles ahead of me on trail because she keeps going after everyone has stopped to rest. Lone Wolf is one member of my trail family that I don’t know as well as I would like. The little bit I do know is very intriguing though. With Lana del Ray as her soundtrack, she spent two years living on a sail boat and sailed around the world. You name a place and she’s been. After that she has worked cool jobs at ranches and resorts in exotic places. She is currently with Prince a few days ahead of me. 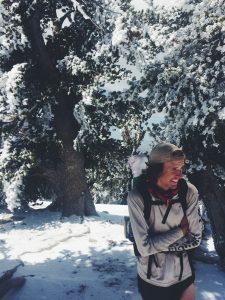 I started backpacking with Nick at mile 788 and have been with him ever since. Not only does he have a great taste in music and an impeccable eye for photography, but he finds a way to see the beauty in every situation. When I am tired and slightly angry at the world, Nick’s romantic view of the world rubs off and lightens my mood. 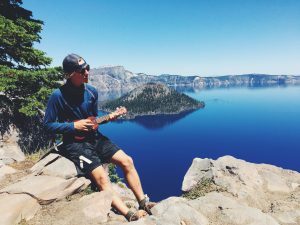 Additionally, this 22 year old from Sweden runs a pct blog and is a better writer than I am by miles. So go check out his page. or don’t because it will make me look bad. People come and go on trail. My time with them is short but their impact on me is great. The trail bonds people in a way normal society fails to. I have only known them a matter of weeks, yet I am closer with them than people I have known for years. They give it character, variety, and meaning. Most importantly, they share in this crazy goal and I feel blessed to call them friends.